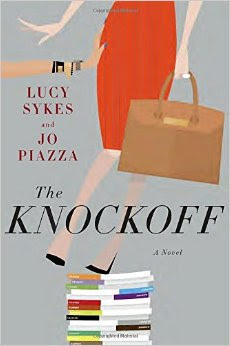 If you are a fan of the book, "The Devil Loves Prada", then you will thoroughly enjoy "The Knockoff" !! Battling out is two types of women at Glossy Magazine...twenty-something who is fresh out grad school who believes the current fashion magazine is dated and plans to turn into an app and forty-something who helped Glossy in the fashion industry that is feeling a little bit out of place but determined to adapt! This novel, which was suggested in the Birchbox Book Club, is a perfect summer read in which I couldn't put down because you can relate to both characters at opposing ends with its funny twist and turns!! Being 30 something, I completely related to Imogen Tate who is remember how it was to climb the career and social ladder in the fashion industry and now trying maintain her editor-in-chief position at Glossy now Glossy.com !! Also, she is feel threaten by Eve, once her assistant, now running Glossy as a digital sweatshop!! I personally cheered for heroine, Imogen, as she grows as character and make a personal discovery for herself!! Whether you pick it up or download, I highly recommend reading this book for your summer reading experience! !